Through generous funding from Mountain Sports Flagstaff and 1% for the Planet, Willow Bend Environmental Education Center offers FREE guided Downtown Geology Tours twice a month, June-August! The 1 hour walking tours are based on local Flagstaff author, Marie Jackson’s Stone Landmark’s book. An exclusive and unique opportunity for the community to explore downtown like never before. 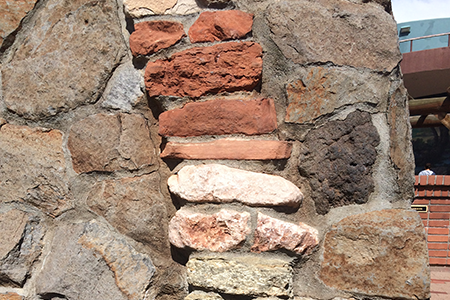 The tour will cover ancient history of stones used to build downtown’s iconic buildings, including Moenkopi Sandstone, Pumiceous Dacite, Kaibab Limestone, and Malapais Basalt. In addition tours will highlight progression of architectural styles, discuss changing preferences for certain rock types, and provide an overview of historic events. Tour is FREE and will be limited to 20 participants so online or in store sign-up is highly recommended. Walk in-spots will be available on a first come first serve basis. Tours start at 1pm (please meet at Mountain Sports Flagstaff, 24 N. San Francisco, at 12:45pm).